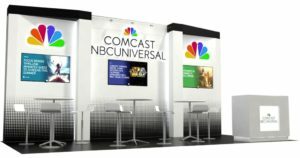 At Las Vegas Exhibit Rentals, we design and build 10x20 rental exhibits that are fully customizable to meet all of your trade show needs. 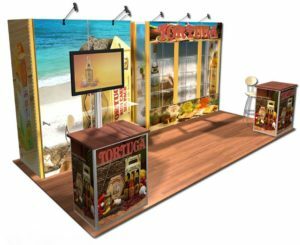 Check out our extensive booth gallery below for more examples. 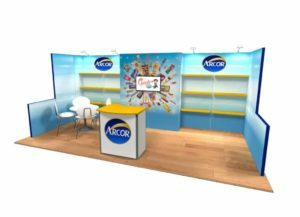 Our displays are flexible and allow you to combine different elements and features from more than one booth to create and exhibit that works best for you. 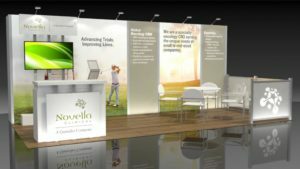 Once you've scrolled through the different booth examples and have a better grasp of exactly what you are looking for, contact us for more info, such as pricing as well as a free design rendering of your own! This next 10x20 exhibit offers a wideset format option. With dual monitors located on the custom back wall and custom shelving options. Additionally, the exhibit offers a seating area with interactive Ipad area. Finally, the exhibit offers wood panel flooring and custom signage. The next 10x20 exhibit option offers a wide range of seating options. 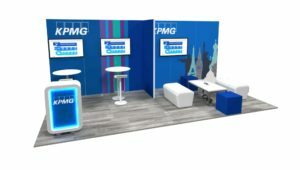 With three separate meeting areas located within this exhibit, this layout features a great example of personable client meetings. Furthermore, this exhibit offers two table areas and enclosed back wall area. 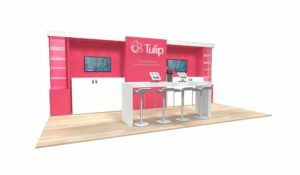 This next 10x20 exhibit offers a frontal reception area and back storage option. 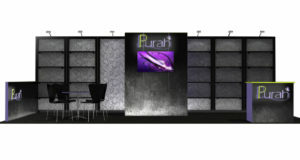 Furthermore, the exhibit provides custom back wall paneling and interior space for meeting clients. This 10x20 is highly unique and provides a ton of features and options. It features a sitdown area, concealed meeting area and frontal kiosk area. 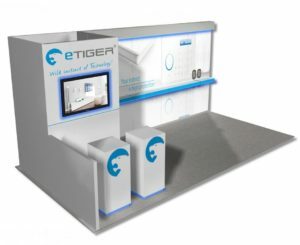 Additionally, this exhibit provides a monitor to display product and customized back panel wall. This next 10x20 exhibit uses its allocated space in good fashion. 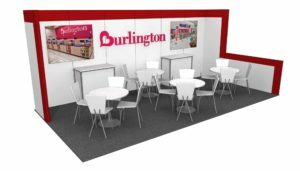 With a seating bench area located in the rear along with shelving options and walkthrough area, this booth has everything you'll need. 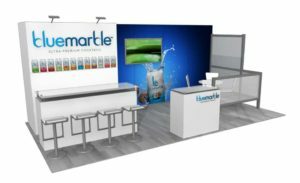 Additionally, the exhibit has a frontal reception area and features colorful custom graphics. This next 10x20 exhibit provides both open area and meeting space. Additionally, sit-down meeting space and three display monitors are also offered. Finally, this layout offers space to meet with clients and display a product. This next 10x20 is a very clean cut layout for a show. The booth features stem lighting to backlight a wall and informative panel backgrounds. Additionally, this exhibit offers a portion of its space as either meeting or seating space. Finally, the wood flooring helps to create a professional layout. 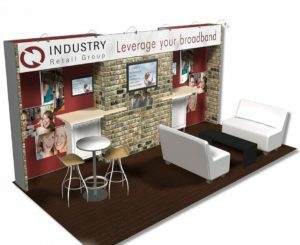 With this next 10x20 exhibit color and custom graphics play a large role. With deep shades of green and blue this exhibit helps to draw clients in from afar. Another key feature is the couch seating area and reception counter for passing people. With these features, you will be sure to draw clients in! The next retail-based 10x20 is great for customers to walk around in. Many open based layouts and multiple shelving options are featured in this exhibit. Another helpful area is the enclosed walls which help to filter out any harmful sounds and distractions. From high walls to shelving options and retail design. 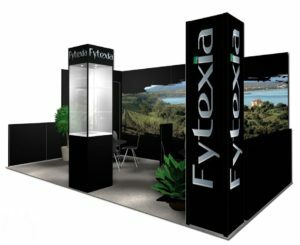 This 10x20 exhibit layout highlights key features to have at a show. From afar the green and white can really help to draw individuals in. Along with this, the exhibit provides encloser and acts as a makeshift store location. This next 10x20 exhibit really emphasizes the feeling of depth through its back wall panel structure. 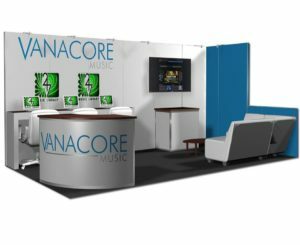 Through the use of dark colors and cityscape, this exhibit layout can help a company standout at a show. 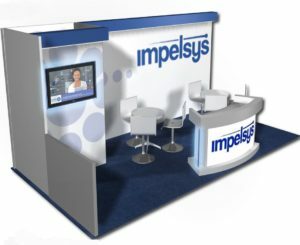 Furthermore, this exhibit provides a customized back wall with monitor and seating area for meeting space. 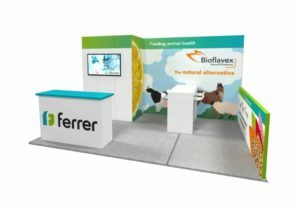 With its tall back walls and multiple signage options, this 10x20 stands out from the normal exhibit. From looking at this exhibit you can see the dual monitors and pillars adding to the height. Additionally, the exhibit has lower meeting space options for clients and customers. The next 10x20 exhibit provides a unique feature for an exhibit. With an enclosed meeting space, this layout provides privacy with customers and any potential client walking by. Furthermore, the glass case behind the reception area is ideal for hosting products. With this next exhibit, the layout is set up to present a creative design that draws people in. With the wavy back wall and custom colored print graphics, this exhibit boasts individuality. 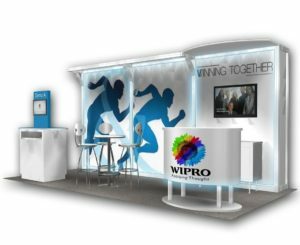 Finally, the exhibit offers features such as duel meeting spaces and frontal kiosk area. 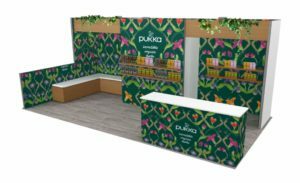 This 10x20 exhibit helps to highlight natural features in the display with the addition of plants. Futhermore, the glass display cases add clear product display to customers. An additional key area is the seating options located in the rear of the exhibit. The next exhibit offers a clean cut exhibit layout. It features duel meeting areas a frontal reception area and customized graphics. The exhibit itself also includes a monitor and custom back panel walls with over hang. With this 10x20 you get not only a custom design but archway and full overhang. Adtionally, the exhibit includes rear storage and reception area located in the front. Finally, this exhibit offers custom graphics and sidewalls. With this 10x20 the setup is very interesting and is different from most. It features allotted open spacing and duel pillars that serve as a meeting space. Along with a shelving space that lines the width of the exhibit. 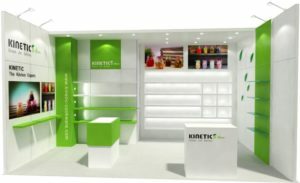 When looking at an example of a 10x20 retail exhibit look no further than this layout. With multiple levels of shelving to present products and seating spaces allocated within the exhibit. This space provides room to meet with potential clients and show a physical product. 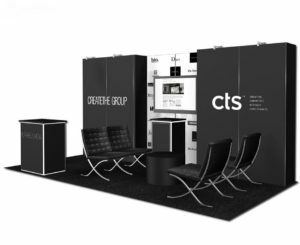 From the comfortable seating area to the reception area this exhibit layout uses space wisely. Additionally, the back wall serves as an interactive sitdown location to explain the product or service. Finally, the exhibit is ideal for a corner or endcap of a show. This next exhibit includes a large meeting space for a 10x20 exhibit. Included with this are reclined chairs and meeting table located in-between. The exhibit also boasts panel back walls, frontal kiosk reception area and a digital monitor. Finally, the exhibit uses stem lighting to highlight the exhibit. For this 10x20 exhibit, the main focus has been on providing walking space and clear reception areas. 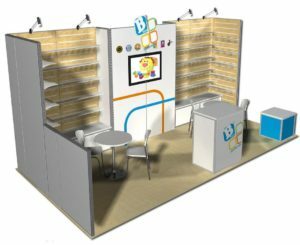 The booth features wood flooring, rear panel back wall, and monitor with shelving option. Furthermore, the exhibit is backlight through stem lighting. 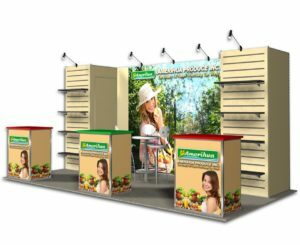 This 10x20 exhibit provides allotted spacing for meetings and presenting a product. With multiple meeting pillars and table for meeting space located in the back. The exhibit also provides custom artwork for the back wall paneling and display monitor. 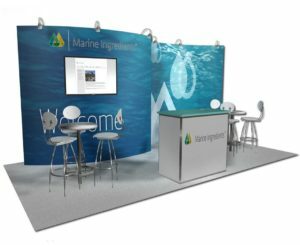 The next 10x20 exhibit example focuses on the color element with custom panel backgrounds. With three panel walls located on either side of a middle wall, it adds depth. Another key feature is the seating area located within the corner of the exhibit. Here you allow customers to sit down and talk. With the next 10x20 exhibit, grabbing attendee's attention is the main intent. 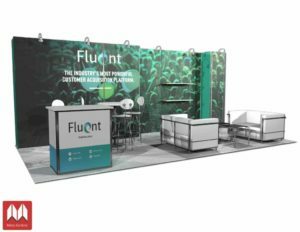 From the three various pillars/reception areas located in the front, along with the custom print graphics and multiple levels of shelving on slot panel walls, this exhibit is a key standout. This 10x20 exhibit is sure to impress with its backlit panels and LED lighting. The meeting space and custom reception counter also play a massive role in adding to this exhibit. This space also includes a storage option. 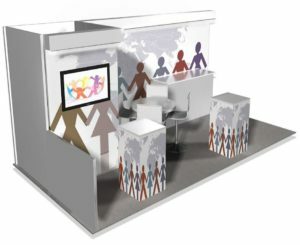 With this warm design for a 10x20, the exhibit offers meeting space and many other features. It includes a brick back wall and custom posters, along with a backlit wall from stem lighting. This exhibit is sure to shine at a show. Find the design that is closest to what you're going for. Our designs don't stop there! 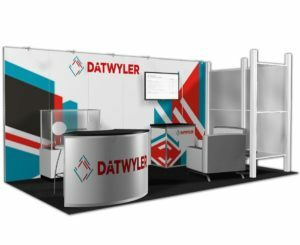 We can provide customizable booth rentals of any size such as 10x10, 20x20, 20x30, 30x30, 30ft-100ft & more. 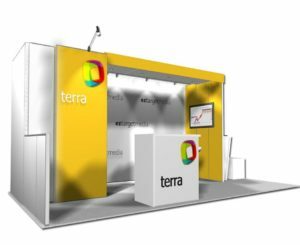 Reach out to our experienced team trade show professionals so that they can guide you through trade show rules and design regulations for your particular event.